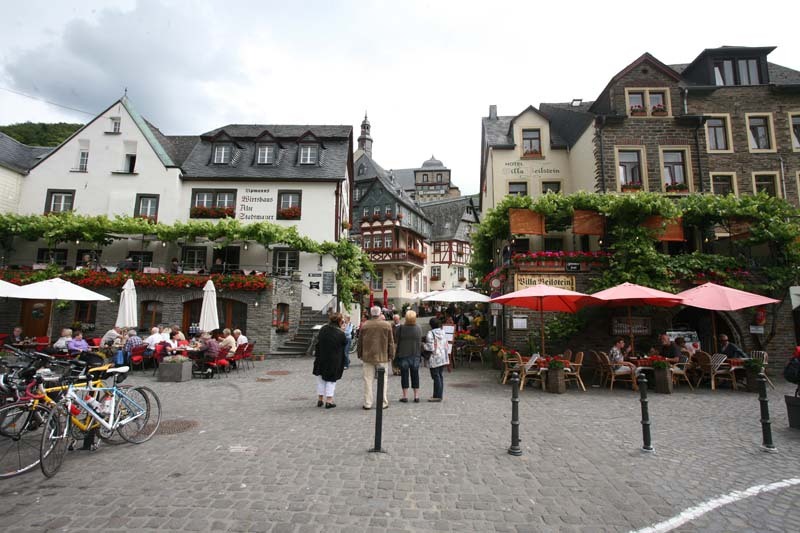 Our trip to Europe this summer was a relatively short one as we couldn’t fit in more than a couple of weeks due to existing commitments, however we did want to continue exploring the German wine route. We left home in early June and travelled to the Camping and Caravan Club site at Sandringham to spend a few days with our friends from Brentwood. They stayed in the Leonard Cheshire Park Hotel outside the “big house”. We visited Sandringham house, gardens, Hunstanton and Wells during a period of mixed weather. We finally said goodbye to our friends and headed for Dover on 18th June and caught the late afternoon crossing. 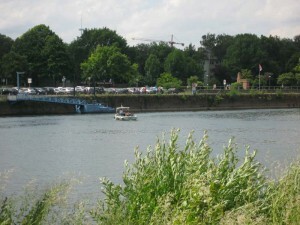 After a short drive we pulled in to the Aire at Cassel for the night. We walked around the sports complex but it was a little too far and too late in the evening to explore the town. 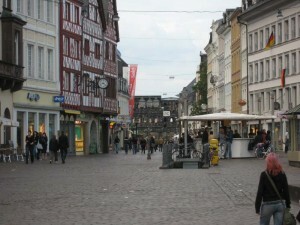 After an early start we headed off for Trier arriving in the early afternoon. At Trier we experienced our first real problem with the Flair – the front window blind, an alluminium roller blind decided to pack in in the down position and in an attempt to raise it I broke the thing in two. While not a major disaster it was inconvienient and after some discussion, and given our close proximity to Polch, the home of N+B we decided to call in to see them on the Monday morning and see if we could get it repaired. We spent the rest of the weekend cycling into Trier before moving on to Urzig, where we cycled into Kinheim and BBQ’d in the evening. The following morning with weather not brilliant and bouts of rain, we decided to drive along the Mosel to Traben/Trabach and dodged the showers to look around. We spent the rest of the day trundling around trying to miss the showers and ended up at Bilstein where another heavy shower prevented us from visiting the Metternich Castle. 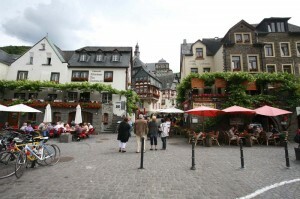 We moved on again this time to Cochem where we spent a good three hours looking around the town. In the evening we moved to Polch so that we had a better chance of being “fitted in” as we didn’t have an appointment. We spent most of the day at Polch waiting for the workshop fitted us in as they were very busy. We were very pleased and impressed with the quality of work. They removed the blind, repaired it and re-fitted it all inside one hour with a total cost of £95 – I had contacted the UK dealer who had quoted some £1600 +VAT – good job well done. How many UK manufacturers will allow you to turn up at the factory for repair work? 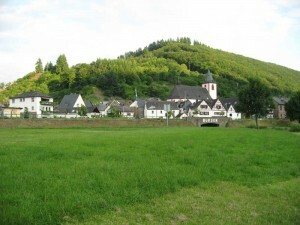 We left Polch and stayed the night at the campsite at Burgen. 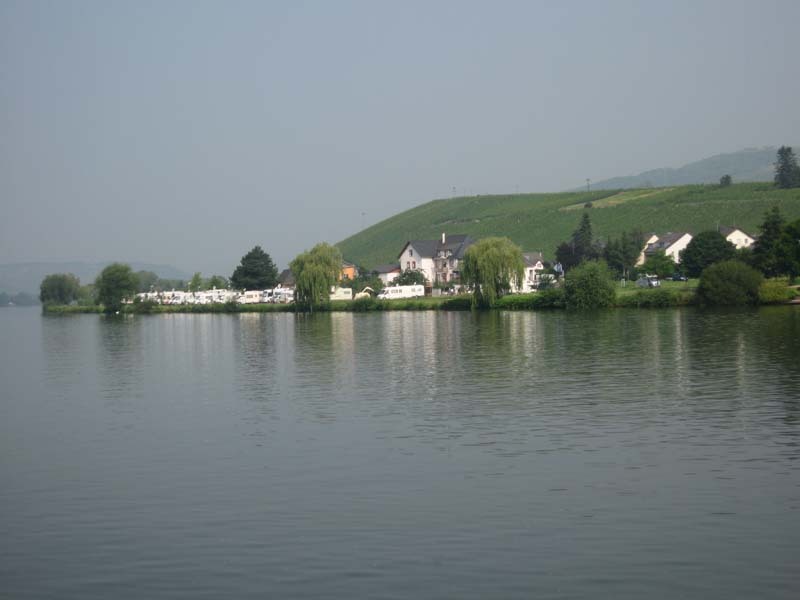 From Burgen we moved on to the camp site on the confluence of the Mosel and Rhine at Koblenz – a lovely spot and at last good very warm weather. 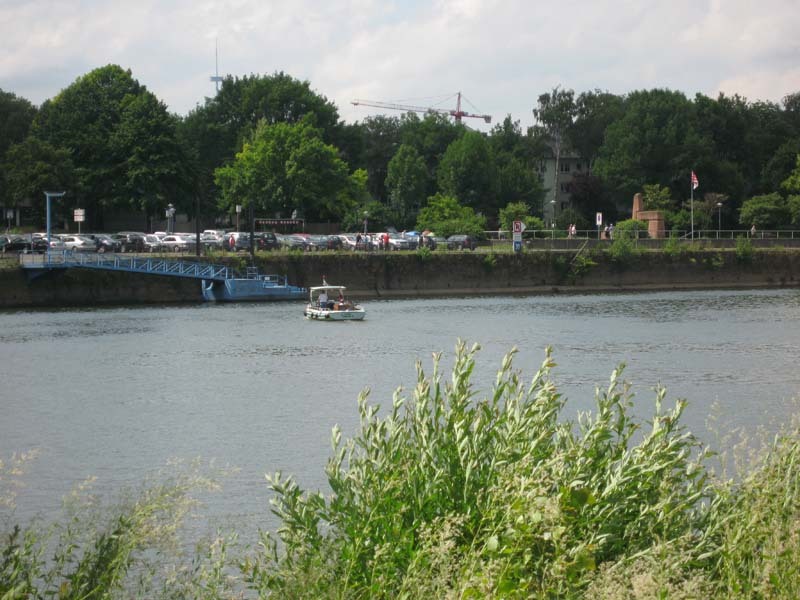 From the camp site you can take the small ferry boat across the Mosel into old Koblenz or you can walk down to the bridge and walk into town. 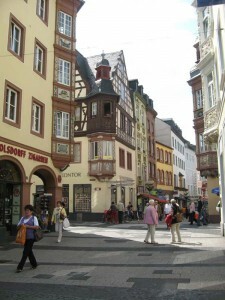 We took the ferry and spent the day looking around the Koblenz old town and waterfront on the Rhine side of town. 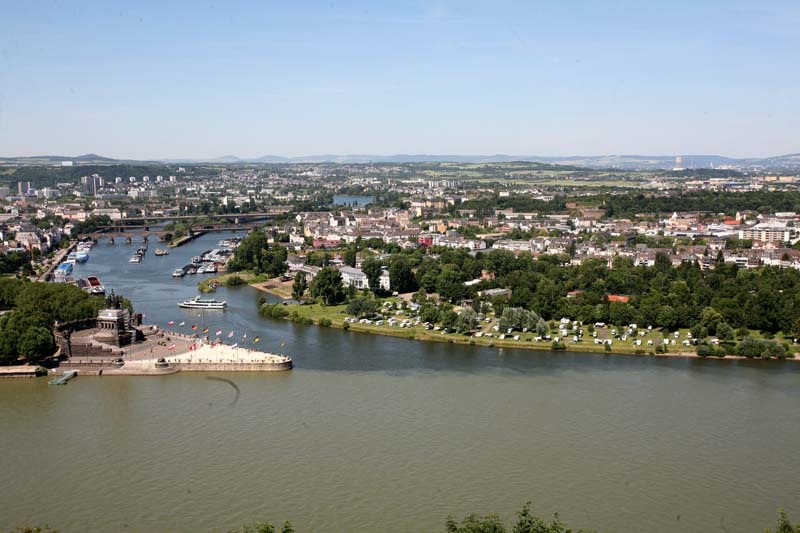 We cycled into town on the second day, crossed the bridge over the Rhine and climbed up to the fortress on the opposite side and got spectacular views of Koblenz, the Rhine and the confluence – excellent trip. We now resumed our trip of following the German Wine Route so set off for the short hop to Bad Durkheim where we parked at the large Stellplatz near the town centre. We couldn’t win as now the temperature was too warm – into the high 20’s/ low 30’s so we relaxed under the awning until the evening before walking into town. Bad Durkheim was a lively town with live music in both the square and the flower gardens and a large gathering of locals in a wine cellar that was built like a wine barrel. 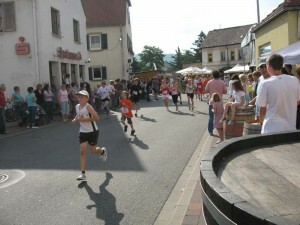 From here we moved on to Neiderkirchen and again the hot weather continued. There are numerous wine festivals that take place along the wine route and it seems that there is at least one festival every week during the summer and early autumn. Next day we moved on a short way to Annweiller and parked on the Stellplatz by the park. There is a castle nearby called Trifels Castle that looked worth a trip up however dogs were not allowed and it was too hot to leave Chase so we walked through the park where there was a brass band playing in the stand. All in all a good day until the evening when a gang of youths with dogs came to camp in the park and create mayhem so we moved off to the secluded Stellplatz behind the shoe museum at Hauenstein for the night. We left after breakfast and moved on to the lake at Wadern Noswelden and had a good walk around the lake and through the village, having lunch on the way. The Stellplatz looked ok here and the lake had a number of cafe’s/restaurants. The next wine festival must have been due soon as they were erecting a marquee by the lakeside in preparation. We then drove to Mehring where we spent the next three days mainly cycling in the morning and sun bathing in the afternoon followed by an evening walk when the sun had gone down. 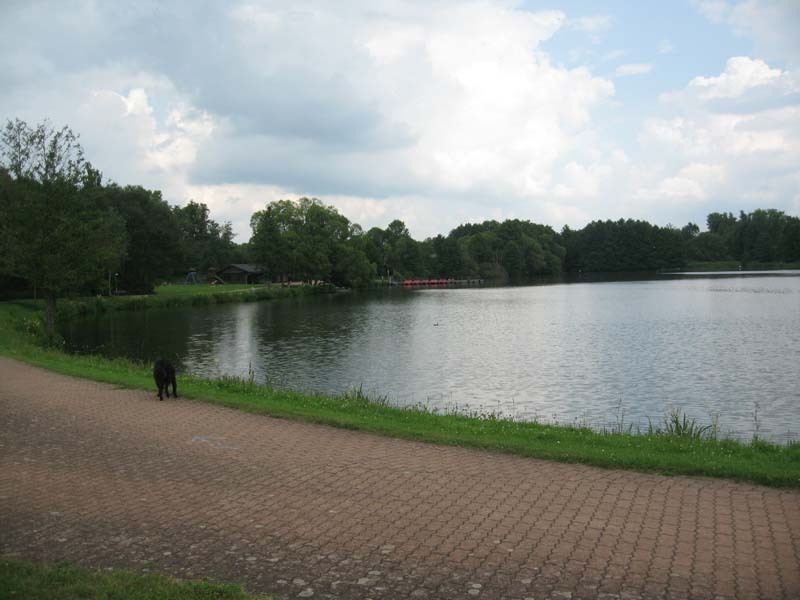 The Stellplatz at Mehring has become a favourite of ours as it has most of the things normally found on a campsite – toilets, showers, cafe, wine bar and service point. 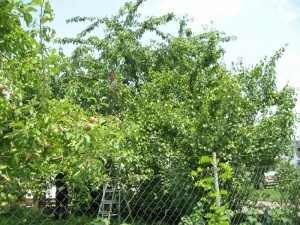 It does have a couple of advantages though – first of all at the end of June, early July the owners let their customers pick cherries from their orchard – as many as you wish. With cherries costing €5 -6 per kilo then it makes the second advantage even better – the charge per night is only €5 so by picking a kilo of cherries you are effectively staying for free. 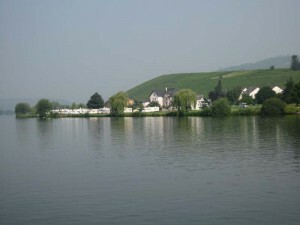 The location is also ideal and we took advantage of the cycle paths on either side of the Mosel. One day we cycled in to Longuich and found a Vet. 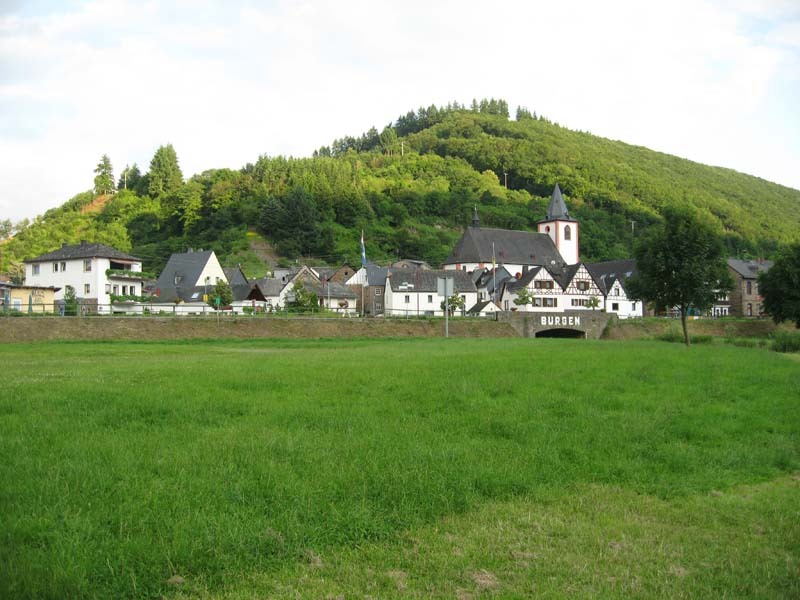 We cycled past the village, over the bridge and back to Mehring – approximately 12kms. The following day we cycled to Thornich and stopped for coffee at a wonderful cafe/wine cellar by the side of the river and cycled down the opposite side of the river – another great day and we covered some 15kms before the sun got too hot. We booked Chase into the Vet at Longuich and set off for Gravelines near to Calais our short holiday coming to an end. We stopped for dinner en-route at Mons and arrived in Gravelines late that night during a terrific thunderstorm. Chase hates thunder and cowered in the shower tray all night. We drove to Escalles the following morning as we had to wait the mandatory 24hrs before Chase was allowed back into UK so we spent the time doing a good walk up past the old windmill, located behind the car park in Escalles walking to the top of the hill, following the track across the road up to the monument at Two Caps , down the side along the cliff and up through the village back to the carpark – around a two hour walk – good for passing the time while waiting for the ferry. We crossed the channel that evening and stayed at the CL just outside Dover, arriving home after lunch the next day.